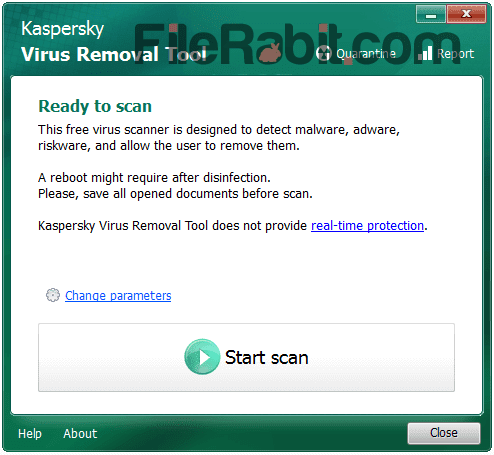 Kaspersky Virus Removal Tool is advanced, smart and comprehensive antivirus software used to eliminate threats. The powerful engine alongwith updated database will destroy worms, trojans, spyware, virus and similar infections. The main objective of this smart tool is to kill viruses from boot sectors, startup objects, system memory and system drive too. This smart tool has its own internal virus definition system based on regular updates that includes virus, worms, threats, trojans and other malicious content. KVRT is portable virus scanning application that does not need any installation. The application is designed to scan, detect and immediately remove suspicious infections including New Folder.exe and Autorun virus attacks. The virus attacks may user’s personal information including username, passwords, login details, credit card, office files and more. If your computer was attacked by adware, spyware, spam, auto-runs and similar vulnerabilities than you need to run atleast one scan with Kaspersky Virus Removal Tool. Kaspersky Virus Removal Tool has safe mod support which will help it running in infected computer. It support both auto and manual removal for various worms, trojans and viruses as well. If your computer was already attacked and previous antivirus software was neutralized then you must test KVRT tool because it has passed with quality standards. Kaspersky Labs are already dealing with dozens of security products including Apple and Linux servers. This tool was released in 2015 for the first time where it was ranked higher each day. KVRT is complete free antivirus, anti-spyware and anti-malware software that is rich with world’s most powerful antivirus engine.